Laser Therapy - Mississauga Chiropractor and Physiotherapy Clinic - FREE Consult! Laser Therapy is the use of therapeutic laser light to provide relief from pain, eliminate inflammation or to repair damaged tissues. 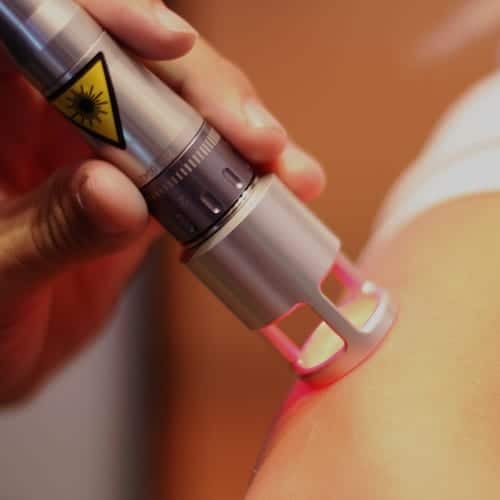 Laser Therapy is entirely non-invasive, rather than destroying tissue, as with surgical lasers, Laser Therapy uses low intensity laser light energy to stimulate cells through a number of known cellular pathways in order to encourage tissue healing. Photons are absorbed by the energy center of the cell which fuels the production of new tissue and helps repair the injured area. Cold Laser Therapy is great for treating any type of acute or chronic inflammatory condition. Some examples are listed below. Call to see if cold laser therapy can help you! Hundreds of research studies have shown Laser Therapy to be safe and effective. Laser Therapy is non-invasive, non-toxic and non-thermal. Unlike other forms of radiation, Laser Therapy is beneficial rather than harmful to tissue. Many Laser Therapy system is FDA and Health Canada approved. There are very stringent safety protocols have have to be met to ensure complete and continuous patient safety.